Dave is an avid fan and producer of charcuterie as well as a creative chef. He is based in Toronto where he has a large curing cellar for his charcuterie. He recently successfully completed a Kickstarter campaign to fund his new restaurant in Toronto which will be opening shortly. His culinary creations are followed by over 37,000 people on Instagram. 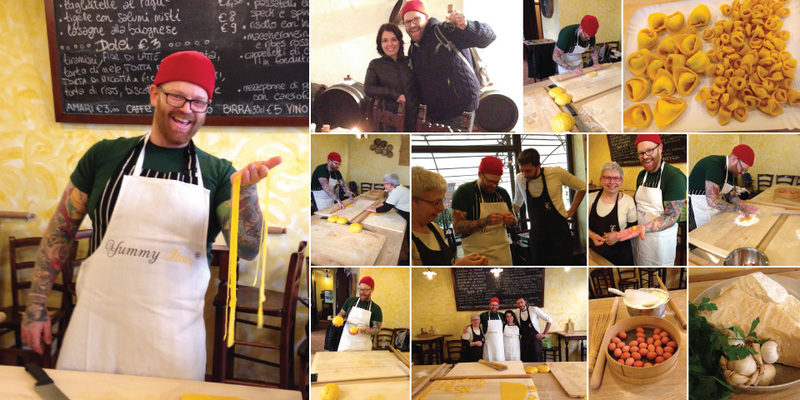 His main objective in spending some days in Italy was to focus on charcuterie, but he contacted us asking to “learn everything I need to learn about pasta in a day”. That and half a day immersing himself in the world of Balsamic Vinegar. We organised an in-depth course with a historic pasta-making workshop, where they have been making pasta with eggs, flour and a rolling pin since the 1940s. He learnt the traditional techniques for making the pasta dough and rolling out the pastry with a rolling-pin, an art which requires many hours of practice to perfect – an opportunity which we provided, under the strict guidance of his tutor. It was a very intensive day starting early in the morning and finishing in the evening. Dave learnt the method for making pasta dough, rolling with a rolling pin and for creating the various pasta shapes and the various fillings. The philosophy of this particular tutor is not to provide ‘recipes’ per se, but to enable to the student to fully understand the tastes, smells, textures and techniques of each and every item of pasta made, in order to be able to recreate them in their home country with the ingredients that they have available. We also organised an in-depth Balsamic Vinegar tasting course by Candlelight together with Dave’s partner, blogger Ayngelina Brogan www.baconismagic.com. As they had already visited several Balsamic Vinegar producers, they were looking for something deeper. They learnt about the criteria set out to establish the ‘benchmark’ for the Traditional Aceto Balsamico di Modena. We also studied the lesser, but nevertheless, optimum products, learnt about food pairings and the best way to serve the various vinegars of different maturations.